VATICAN CITY—Alerting faithful around the world to changes regarding its process of beatification and canonization, Vatican spokesman Fr. 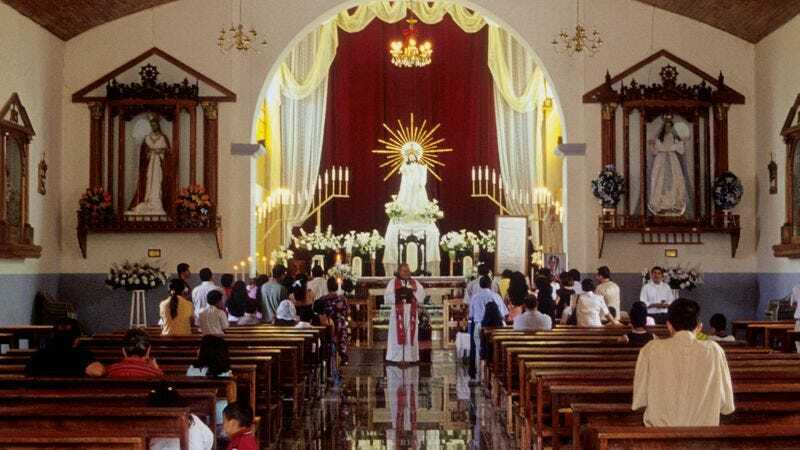 Federico Lombardi announced today that the Roman Catholic Church will now bestow sainthood on any man or woman who attends weekly mass on a regular basis. “After careful deliberation and prayer, the Church has elected to enter any believer into the Canon of Saints so long as he or she is pure of heart and shows up to mass once a week, or even three out of four times a month,” Lombardi wrote in a statement distributed to all dioceses worldwide, noting that the Congregation for the Causes of Saints will promptly begin taking up the cases of any parishioner who arrives on time and stays for the whole thing. “We are also waiving the requirement that individuals be dead before attaining sainthood. As long as you take Communion and stick around for a few minutes after the service, you’re pretty much in. You can be patron saint of anything you want—good health, food, music, whatever—as long as you’re sitting in that pew.” Lombardi said that in addition to revising canonization procedures, the Vatican would now allow anyone who attends mass to put on the priest’s vestments at the end of the service and play the church’s organ if they want.